Disclaimer: This post is sponsored by LARABAR. 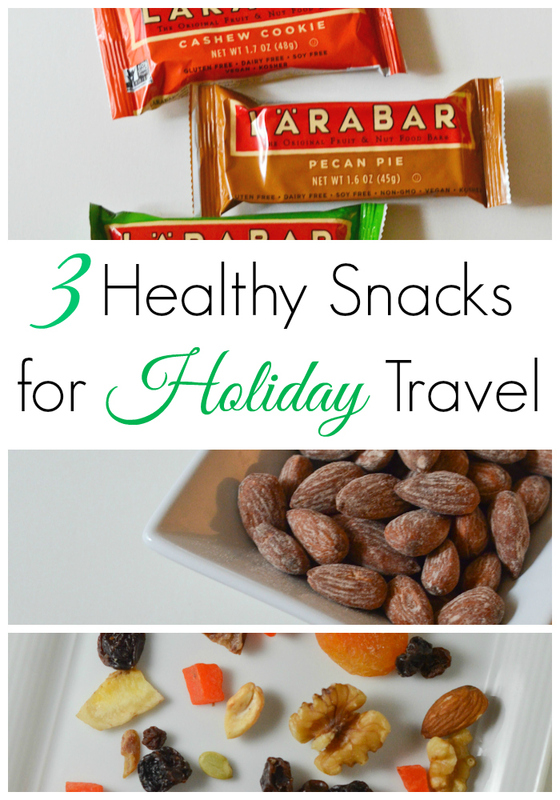 With lots of holiday travel likely ahead, I wanted to share three clean-eating snacks to pack with you. I don’t know about you, but I find that clean eating can be a bit of a challenge when I’m traveling. Healthy choices can oftentimes be difficult to find. Rather than relying on chance and hoping I find good options, I prefer to keep healthy snacks on me. I like to eat healthy because of how it makes me feel. Excessively sweet and processed treats give me sugar highs (and crashes). Overly processed, empty-calorie snacks often don’t fill me up or make me feel worse after eating them. On the other hand, clean eats keep me energized, motivated, and generally in good spirits. And I want to be feeling my best so I can spend time mingling with family, playing with the kiddos and fur babies, holiday shopping, wrapping gifts, and all that jazz. Don’t you? I’ve been eating LARABARs for several years now. I think I’ve tried almost every flavor, save some of the holiday flavors. I tried to buy some holiday bars today, but they were sold out. Anywho, LARABARs were one of the first snacks I discovered when I decided to stop yo-yo dieting and start working on adopting a healthy lifestyle. Although they’re not a source ingredient, I consider them clean eats because of their short ingredients lists and minimal processing. I love how almost every bar offers one fruit serving. Depending on where you’re traveling to, fruit may be difficult to get a hold of. Sure, you could stick a bunch of bananas in your suitcase, but wouldn’t a tidy little bar be better? In all seriousness, LARABARs are highly portable, and if they get a little squished, it doesn’t impact their taste at all. The other fun thing about LARABARs is the variety. They have so many flavors (over 20!). I definitely have my favorites (Cherry Pie, Coconut Cream Pie, and Chocolate Chip Brownie), but it’s nice to mix them up. 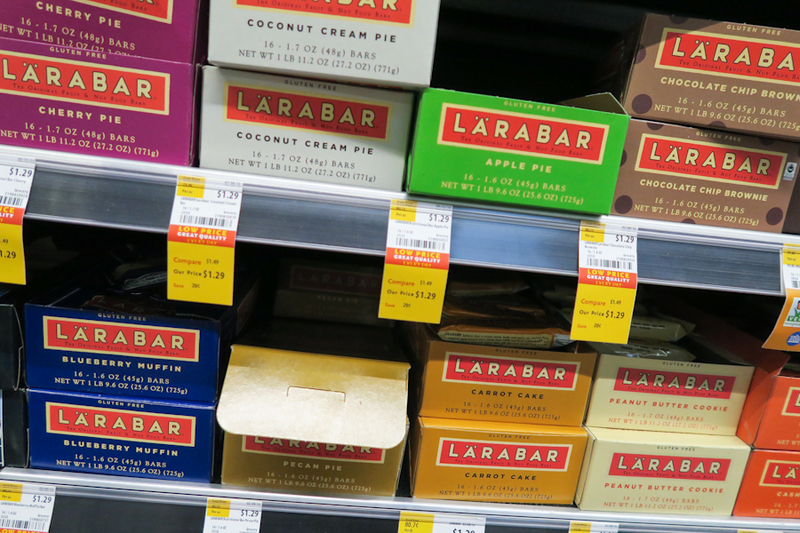 And unlike some bars that have a weird, chalky taste due to added ingredients, LARABARs are delicious straight up. I guess when the base ingredients are so delicious, you don’t need to alter them much to make them taste good together. I have wondered what magic they use on their bars to make them taste so good. The Cashew Cookie, for example, really does have a cookie-like flavor. This continues to surprise me since the ingredients are only cashews and dates. 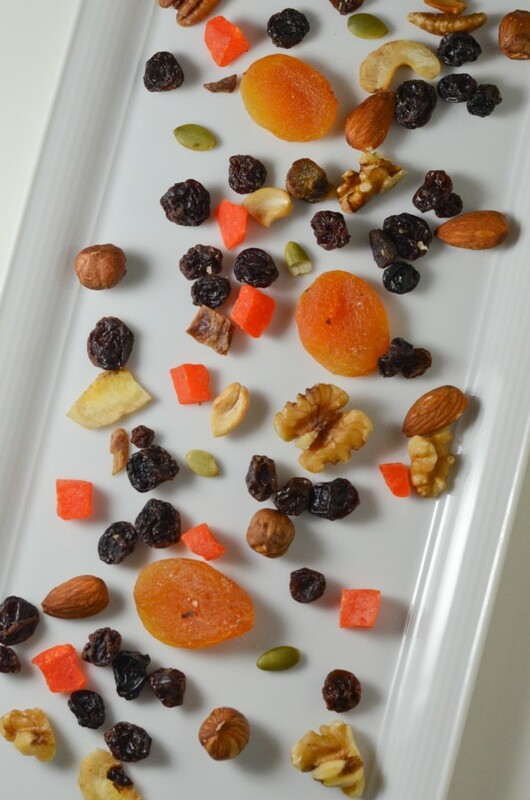 The combination of fruit and nuts helps me stay energized throughout my trip. 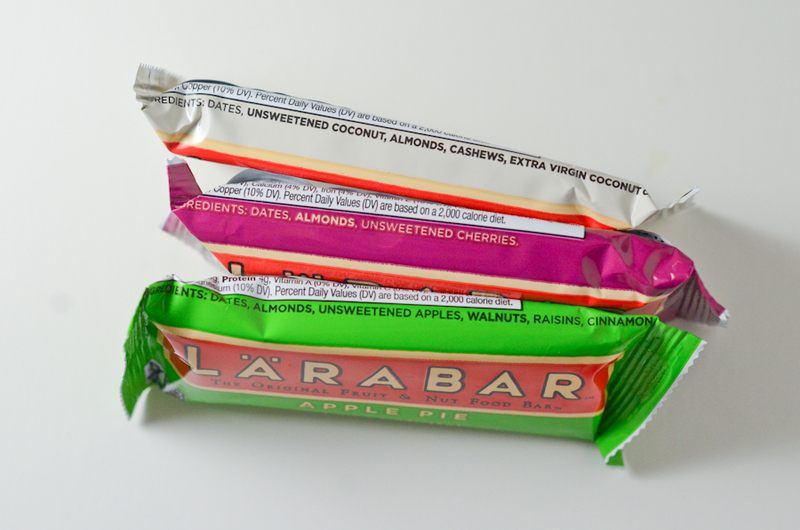 And LARABARs also make a great pre-workout snack if you’re working out on the road. They were my go-to pre-workout snack before I started eating an apple. In case you don’t have time to shop before your trip, these bars are easily found with most other snack bars (typically at grocery stores or Target). The snack-bar section can be overwhelming, but keep an eye out for these. A final perk I’ll mention about LARABARs is how affordable they are. I scored some today for only $1.29 at Whole Foods, plus I got an additional 10% off all but one since I bought 17 (a case, plus one). Like the LARABARs, I pretty much like to have these on hand at all times. Whether it’s to satisfy a craving for something salty or if I need something to hold me over before my next meal, these are a go-to. I usually go for roasted, salted almonds. But there are many kinds of nuts and so many flavor variations. I tend to stick to the salty ones, because if I want something I sweet, I’ll go with one of the previous or following options. Even in the savory category, there are many types: raw, salted, tamari, smoked, BBQ, etc. 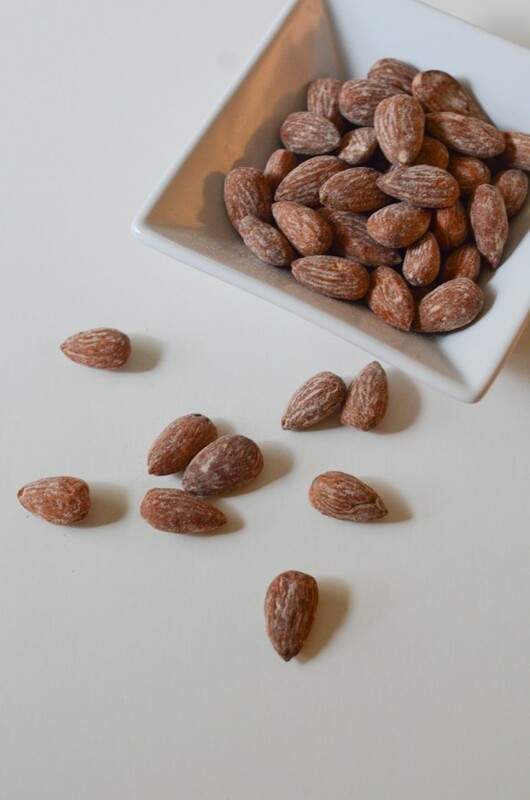 And almonds are my favorite for snacking, but I also like the mixed-nut combinations because they all have their own nutritional benefits. Dad keeps telling me to eat one Brazil nut per day. I’ve looked into the health benefits of nuts before, but it’s hard to remember all that information. My general approach is to stick with my favorite (almonds) or enjoy a nice mixture to be well-rounded. 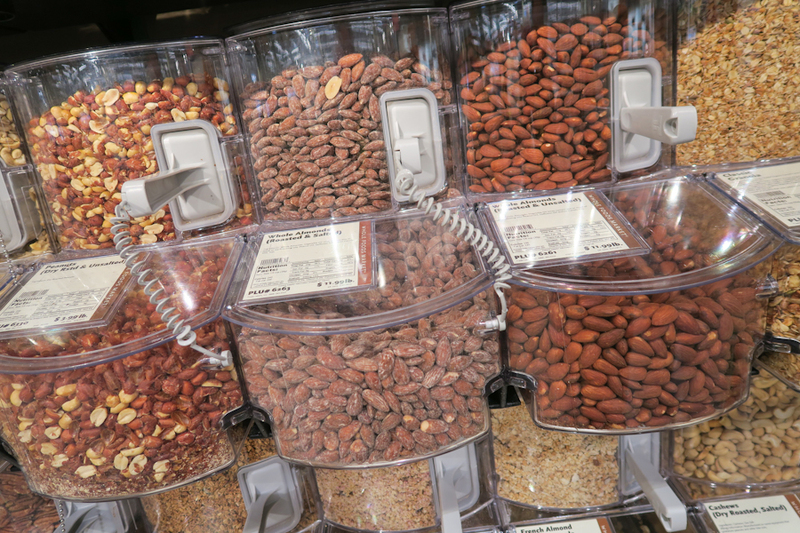 You can read more about general nut and seed health benefits in this article by Sylvie Tremblay on the SF Gate blog. Or you can read about the health benefits of almonds, Brazil nuts, cashews, chestnuts, hazelnuts, macadamias, pecans, pistachios, and walnuts in this BBC Good Food article by Kerry Torrens. I love to get these at the bulk bins, but the pre-packaged tins can be convenient for packing. Although, with almonds already being so durable, you really don’t need the tin. In some ways, a bag is better because it can take up less space as you eat them all. I also like the individually wrapped nuts you can get at Trader Joe’s and other vendors. If you don’t like just nuts, try a bag of snack mix (also known as trail mix). There are so many options; you can really go crazy here (or make your own). I like to get these from health-food stores because I think they tend to be more clean eats in nature. 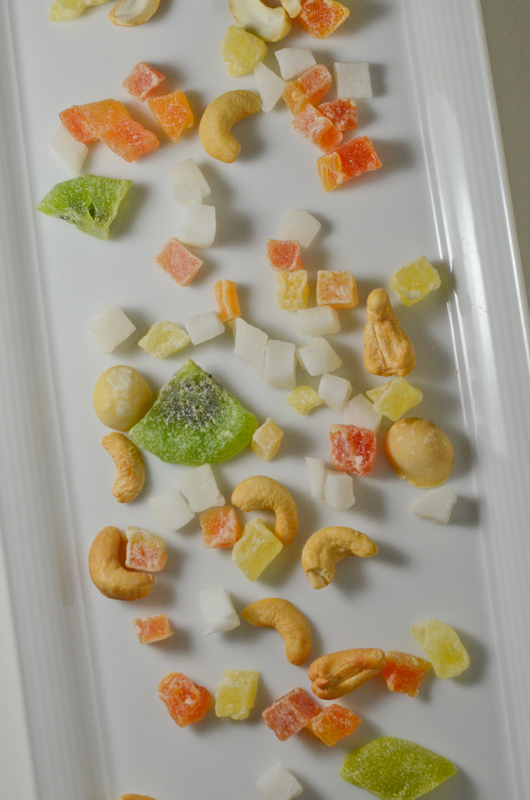 Some are simply a mix of dried fruit and nuts. Some are coated in various flavorings. The bulk bins should have ingredients lists you can read to see what all you’d be eating. I definitely recommend getting some with protein (nuts and seeds) for staying power. I also recommend trying to get only as much as you think you’ll eat. That’s one of the perks of shopping in bulk bins. You can get a little or a lot. You can also get a few different bags so you have options. I recently had to travel for work-related training and was late packing, which meant I forgot to buy and bring snacks. Luckily for me, a quick Google search showed me that there was a health-food store only five minutes away. I found some tamari almonds and mixed nuts to keep in my purse throughout the week so I could quietly snack during the training sessions when hunger hit me. Price-wise, I find that these vary quite a bit. 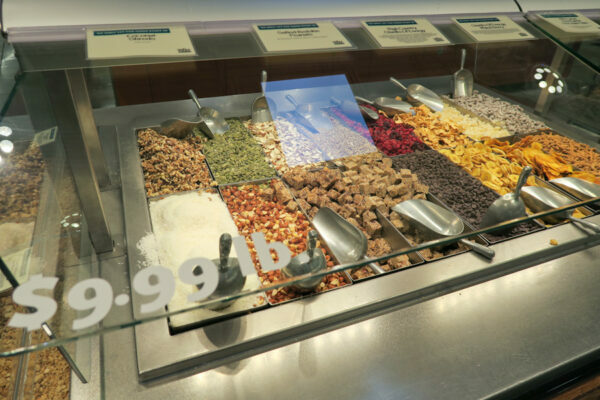 Nuts are pretty pricey. Dried fruit and other carb-like snack ingredients are less so. Mixes of 100% nuts can be expensive, and those with fruits, pretzels, crackers, etc., will generally be more affordable. I recently discovered this snack-mix bar at my local Whole Foods. How fun is this? You can put all kinds of fun, healthy snack items together and pay by the weight. Just like with the bulk bins, you just buy what you need. This is also a good way to figure out what types of snacks are your favorite. If you’re not sure, try a little bit of everything that looks interesting. What’s your favorite snack to pack when you’re traveling? At LARABAR®, we believe that the foundation of a sound mind, body, and spirit is derived from what you eat—and what you eat is most delicious and satisfying when it’s in a whole, natural state. Disclaimer: When my blog network, Mode, put out a call for a sponsored-post opportunity and I saw it was for LARABAR, I jumped on the application. I’ve seen tons of ad opportunities before, but most didn’t resonate with me. LARABARs have been one of my favorite snacks for the past several years. They were even one of the first healthy snacks I added to my eats collection when I got serious about being healthy the happy way. I’m so thrilled I was selected. This post is sponsored, and the bars featured in this post were purchased with a stipend, but the content and opinions of this post are my own. I hope this post helps you out not only this holiday season, but also for other trips in the future. 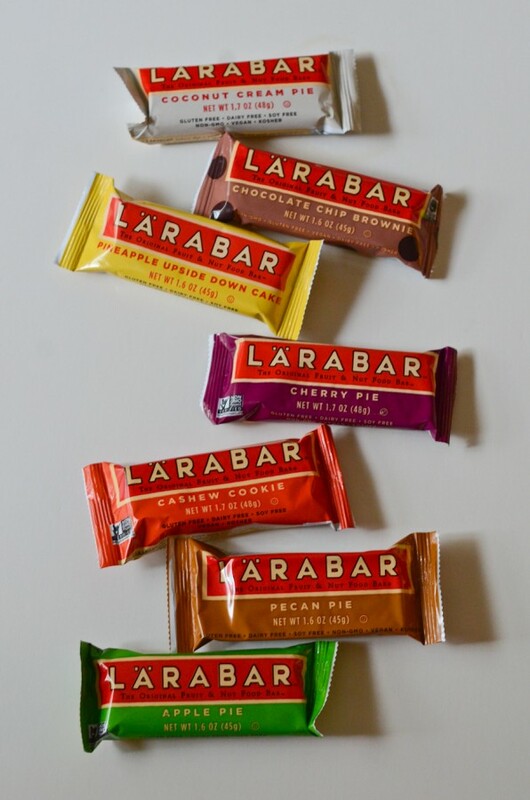 I know this is nuts (pun intended) but I’ve never tried LARABARS! But knowing they’re one of your favorites makes me excited to try them!! Thanks for this post. I love the bulk bin recommendation too. I always forget to hit the bulk bins!